With a little toddler, New Years Eve is not what it use to be for us. 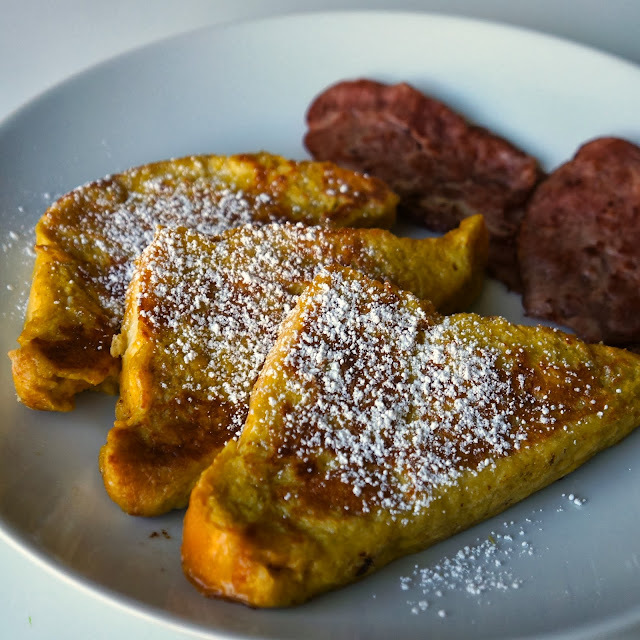 Rather than a champagne toast, we rung in the new year with some French toast... for breakfast on New Years Day. As we end a year and begin another, I want to thank you all for taking the time for visiting here. I look forward to sharing more of my creations this coming year. Here's to an inspiring, joyous and prosperous 2014! Happy New Year, y'all. whisk eggs, cream, milk, and cinnamon together. place bread into egg mixture and allow each slice to soak up the liquid for a few minutes. over medium heat, melt some butter in a frying pan. add as slices of bread onto the pan. fry each side of the bread until brown, turning them over when necessary.